The Attorney General is Maryland’s chief legal officer and is elected by Marylanders every four years. The Attorney General’s Office is in charge of Maryland’s legal business, including acting as a legal advisor to the State of Maryland. To learn more about the Office of the Maryland Attorney General, check out their website. In its role as a legal advisor to the State of Maryland, when requested by the Maryland General Assembly, the Governor, the Comptroller, the Treasurer or any State’s Attorney, the Attorney General provides a formal opinion, which is a written response to specific legal questions raised by Maryland’s government officials. The legal questions can range from the construction of statute, interpretation of case law or requests for legal counsel. Often, these opinions deal with a significant legal question involving Maryland law. Private individuals cannot request a formal Opinion of the Attorney General. However, it is a possible that an Opinion of the Attorney General addresses a legal issue that is directly related to your matter. In that scenario, a Maryland court may consider an Opinion of the Attorney General, but the Opinion is not binding authority for Maryland Courts. You can find Opinions of the Attorney General, from 1993 to the present, online at the Maryland Attorney General’s website. The Law Library’s collection include hardbound volumes of the Opinions of the Attorney General from 1917 to 2011. 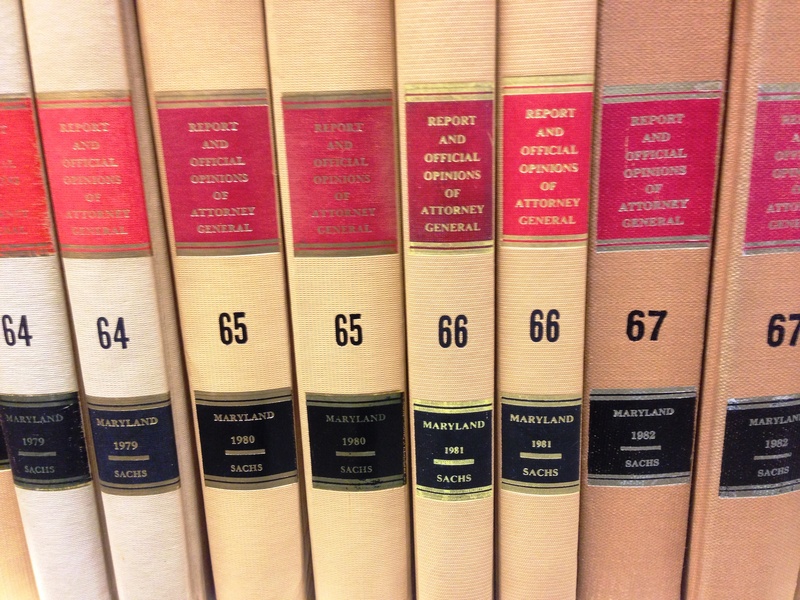 You can also access Maryland Attorney General Opinions through the Law Library’s subscriptions to Westlaw (coverage from 1977 to the present) and LexisNexis (coverage from 1970 to the present). Note that Opinions of the Attorney General are formal opinions, which should be distinguished from other written documents from the Office of the Attorney General, such as letters to state agencies and memoranda of law. In order to be a formal Opinion of the Attorney General, the document must have gone through a specified review process and adopted by the Attorney General of Maryland. More information is available here. This entry was posted on July 24, 2015 at 7:00 am	and is filed under lawlibrary, Maryland Law. Tagged: lawlibrary, legalresearch. You can follow any responses to this entry through the RSS 2.0 feed. You can leave a response, or trackback from your own site.